The enemy wants us to feel rejected . . . left out, lonely, and less than.In Uninvited, Lysa shares her own deeply personal experiences of rejection--from the perceived judgment of the perfectly toned woman one elliptical over to the incredibly painful childhood abandonment by her father. She leans in to honestly examine the roots of rejection, as well as rejection's ability to poison relationships from the inside out, including our relationship with God.With biblical depth, gut-honest vulnerability, and refreshing wit, Lysa will help you:Stop feeling left out by believing that even when you are overlooked by others you are handpicked by God.Change your tendency to either fall apart or control the actions of others by embracing God-honoring ways to process your hurt.Know exactly what to pray for the next ten days to steady your soul and restore your confidence in the midst of rejection.Overcome the two core fears that feed your insecurities by understanding the secret of belonging. 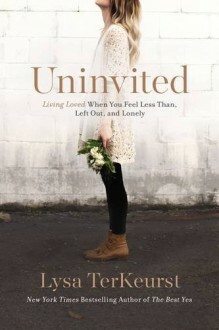 Uninvited reminds us we are destined for a love that can never be diminished, tarnished, shaken, or taken--a love that does not reject or uninvite.